Last week the news broke that Stratford’s King Edward VI School (Shakespeare’s School) has won its bid for £1.4 million from the Heritage Lottery Fund. This is excellent news: this money will enable the school to carry out much-needed conservation work as well as opening the building up for visitors to the town to enjoy, and developing activities for schoolchildren. 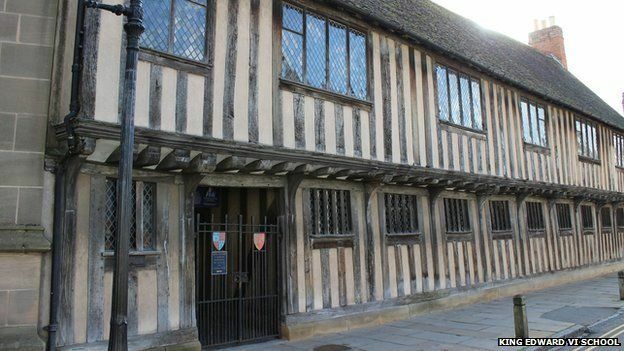 The upstairs room was used as a schoolroom during Shakespeare’s day so is where Shakespeare would have learned his Latin as well as becoming acquainted with the classics including Virgil and Ovid, and learning the art of rhetoric which he would put to good use later. The downstairs room was where the Town Council met, including, for most of Shakespeare’s childhood, his own father, and it was in the Guild Hall where professional players performed. This is, then, almost certainly where Shakespeare saw his first plays. 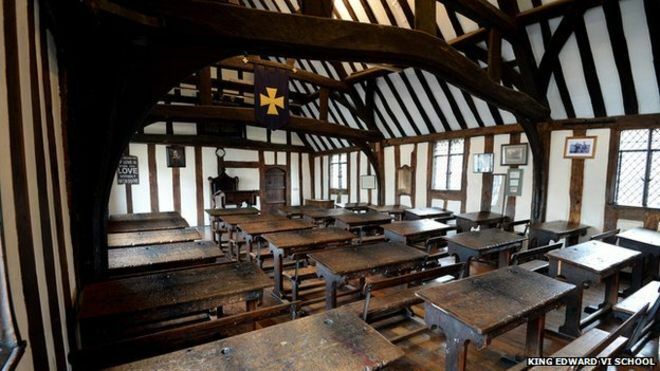 There’s a real sense of history in these rooms and the schoolroom is to me the most impressive of Stratford’s half-timbered spaces. It never fails to impress, but until now it’s only been able to open it occasionally, and there must be many regular visitors to Stratford who have never had the chance to go inside. I’ve been told that the schoolroom can claim to be the oldest room in continuous educational use anywhere in England. Indeed, it has been little altered since it was build around 1420, though the wooden desks are considerably more modern. 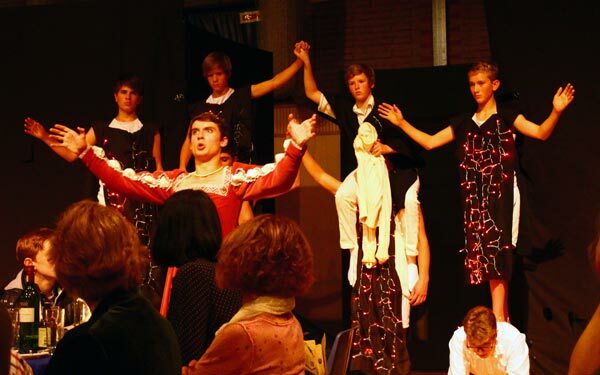 King Edward VI School has more to be proud of than its Shakespeare claims. The connection between that room, the downstairs Guild Hall, the Guild Chapel and the Alms Houses demonstrate the priorities of the medieval town to govern itself, to respect religion, to educate the young and to care for the elderly, all within one small area. Primary school children from the area will learn about the school and its history through hands-on educational visits and there will be interactive displays to explain the use of the rooms at different times. As well as conserving the timber structure, conservation work will be carried out on some wall frescoes that have been only recently fully uncovered. Here’s the link to the press release. The project is due for completion to mark the four-hundredth anniversary of Shakespeare’s death in April 1616. Importantly, the school room remains in use, and KES continues promotes a wide range of activities. In Shakespeare’s day, most lessons were completely different from today, with much learning by rote, and there are several scenes in Shakespeare’s plays that refer back to his schooldays, especially one scene in The Merry Wives of Windsor, and the portrayal of a schoolmaster in Love’s Labour’s Lost. However like other grammar schools pupils would have put on plays, and today the drama group Edward’s Boys present the repertoire of the boy players of Shakespeare’s time. They have built a fine reputation, and this year’s production of John Ford’s The Lady’s Trial is to be performed at the Sam Wanamaker Playhouse at Shakespeare’s Globe on 26 and 27 September. The group performs challenging plays, some of which, like The Lady’s Trial, have been neglected since the 1630s. The founder and director of Edward’s Boys, Perry Mills, explains the background to the play in this newly-released trailer, which also features clips of the cast delivering lines from the play. This entry was posted in Shakespeare's World, Stratford-upon-Avon and tagged Edwards' Boys, King Edward VI School, Perry Mills. Bookmark the permalink.